This week has been extremely busy and chaotic, hence the lack of blog updates. In either case, a couple months ago, I picked up Eve Online which is a scifi massive multiplayer game. Don't worry, I am not hopelessly addicted to this game as the game isn't a massive time sink. Anyway, a few people have been asking what it's like, so here's a video that highlights the combat aspect of the game. The video is entitled "War Has Come to Eve", and the graphics are absolutely gorgeous. Everything you see in the video is apparently from actual game footage. I say apparently because I'm on a much older and slower computer, so the graphics I see are no where near as pretty as this. This video scored bonus points for me because it features music from "All Along The Watchtowers" by Bear McCreary, which is one of my favourite songs from the Battlestar Galactica soundtrack. I'll end this post now because I think I've exceeded my geek quota for the day. Don't worry, even though the title has the word "hope" in it, this entry has nothing to do with President Obama. In either case, sorry for the break in blogging, I've been preoccupied pondering about what lies in store for me in 2009. I had a battle plan all worked out for this year, but half of the goals in it are already void as the situation on the ground has already changed that quickly. As they say though, one of the first casualties of war is the battle plan. The Art of War also says, "just as water retains no constant shape, so in warfare there are no constant conditions." Anyway, while I was away from California, the church which I attend in San Jose started a 4-week series entitled, "Miracles." My mom usually listens to those sermons as well, and she asked if I had heard it yet as it was amazing. I hadn't and life went on. When I got back to California, I had lunch with one of my church friends, and he asked if I had heard that sermon, and he implored me to listen to it. I finally got around to listening to it tonight, and I have to say it was an awesome way to start 2009. Despite all the horrible news around us, it's a nice change to hear good news. The sermons are archived here, and there's a video version, and an audio version. Are you struggling financially? Is your health what it used to be? Have your relationships become difficult to manage? Whatever situation you find yourself in, no matter how discouraged you have become, there is hope. The good news is this: God is committed to taking care of your needs - physically, emotionally, spiritually, and relationally. No matter what circumstance you find yourself in, God is ready and willing to meet your need. There's one line in the sermon that really stood out (and I'm paraphrasing): "You ask, what happens if I get my hopes up, and nothing happens? You should be asking, what happens if I get my hopes up, and something does happen?" I'll be the first to admit for my battle plan to work out, it's going to involve a few miracles, a bit of faith, and a bit of bravery. Anyway, I'm going to mark down some milestones as a note to myself should things work out. Jan 22, 2009 - Operation Delicious Victory. Jan 26, 2009 - Operation Valour. I have to say I'm a bit excited about how 2009 is going to unfold. One last thought that someone conveyed to me recently, when you finally succeed in your goals, all of those past failures will suddenly matter a lot less. So my trip back to California was quite long and tiring. It all started when I got to Victoria International Airport at 10:20am, 1h 20m before the flight left. I go to the check-in counter, and there's a huge line of passengers. That's a bad sign. Eventually I figure out from people's murmurings that my flight into Seattle was canceled because there was too much fog on the Seattle side. The attendants at the check-in counter were busy trying to book new tickets for passengers. For those keeping count, yes this is the dreaded Victoria-Seattle route operated by Horizon Air / Alaska Air, the route that is perpetually delayed whenever I take it. As time moved on, people in the line grew increasingly impatient. This was partially due to the fact that one of the attendants decided to leave, which left only one person working the counter. The other reason was because Air Canada was able to get a flight out to Seattle at around our departure time, so what gives? After waiting in line for an hour, I finally get to the attendant. She informs me that the next flight to Seattle is at 4pm, and the connecting flight to San Jose departs at 8pm and arrives at 10pm. This was no good because that meant that I would be waiting at the airport for five hours, and the bus routes I rely on in San Jose don't run at 10pm. Luckily I recalled that United Airlines runs a direct flight between Victoria and San Francisco, so I inquired about that flight. Departure at 2:40pm, arrival at 4:40pm. If this was the amazing race, a move like this could put my team in the lead. This meant waiting at the airport for three hours, and getting into the Bay Area a full 6 hours earlier, so I opted for this flight. The United plane was actually not bad. It's smaller than the one from Seattle-San Jose, which meant loading times were much faster. The chairs were nicer, and I had way more leg room. The view was also much nicer when approaching San Francisco. Yes, this took five transfers to finally get home. I have to say that the train system there is absolutely ridiculous. The BART is one train system, and CalTrain is another; they should really just harmonize the two train systems. My assertion that the Bay Area's public transit is awful still stands. Anyway, I managed to finally get home at 8pm. So total travel time + waiting time = ~10 hours. It was a long and tiring day. On a positive note, I managed to finish reading Sun Tzu's Art of War in only one day. First book of 2009 completed. Yesterday was the five year anniversary for Yahoo! Search. To celebrate, the Food Network came by to film an episode of Dinner Impossible with Chef Robert Irvine. Unfortunately I wasn't able to attend because I'm in Victoria, but I have plenty of information and pictures from co-workers. As usual, I believe the chef shows up, and gets 6 hours to whip up a menu to feed a lot of hungry people. In this case, he had to feed 450+ hungry Yahoos. My divisional manager was in charge of buying food. Two of the search executives (Tuoc and Raj) got to work as sous chefs, as seen here. The official Yahoo Corporate flickr account has a bunch of photos of the event as well. In attendance were also the Yahoo founders, Jerry Yang and David Filo, as well as Yahoo's new CEO, Carol Bartz. 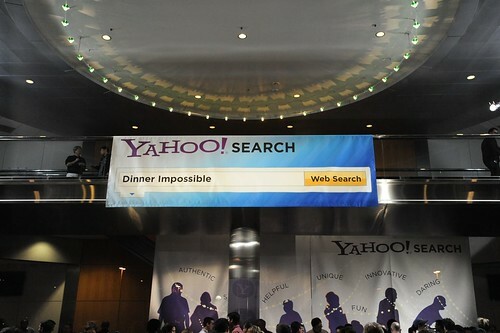 This Yahoo Edition of Dinner Impossible will be aired in March sometime, so keep your eyes peeled for it. You'll see a lot of the people that I work with, and all the awesome people that work at Yahoo Search. The Ontario chapter of the union made headlines which is captured in this editorial entitled, "CUPE call to ban Israeli academics out to lunch." For those not familiar with CUPE, it's Canada's largest union. A huge chunk of university workers are a part of this union. Thanks Myron for sending me this link. CUPE Ontario has embarrassed itself again. The union’s president, Sid Ryan, is backing a move that would call on Ontario universities to ban Israeli academics who aren’t prepared to condemn Israel’s current military operations in Gaza, and specifically the Dec. 29 bombing attack on the Islamic University of Gaza. Mr. Ryan’s meddling is wrong-headed, on multiple levels. As many in Ontario academia have pointed out in denouncing Mr. Ryan’s plan, the proposal violates the essence of the concept of academic freedom. By demanding adherence to a particular political point of view, with a professor’s job hanging in the balance, CUPE’s stated goal runs counter to the core mission of institutions of higher learning: promoting free academic inquiry. Mr. Ryan proposes a political litmus test to decide whose views should be allowed to be expressed. That’s a contravention of the Canadian Charter of Rights and Freedoms’ protection of free speech, as well as an act of discrimination under this country’s human rights codes. CUPE Ontario’s actions are also inconsistent in that no such bans are sought on academics from oth­er parts of the world where charges of repression are rampant. If Israeli professors are to be barred from teaching based on what they say about Gaza, why not ban Chinese academics over China’s role in Tibet? Or Russian professors for their country’s controversial campaigns against Chechnya? As Bernie Farber, Canadian Jewish Congress CEO, pointed out last week, CUPE has not called for Palestinian academics to be banned over Hamas rocket attacks. (It should be noted that Israel claims the Islamic University in Ga­za was a storehouse for munitions and bomb-making centre.) Such scenarios should seem ludicrous, of course, but that further underlines the fact CUPE Ontario seems to devote a lot of time and attention to anti-Is­raeli efforts. That obsession has not surprisingly led to accusations CUPE Ontario is anti-Semitic. The union denies such charges. Another question many have is why a union that supposedly exists to fight for better wages, working conditions and other benefits for members is using its resources to take sides in a bitter, deeply complex dispute thousands of miles away. CUPE Ontario was roundly criticized several years ago for calling on learning institutions to divest themselves of Israeli investments. Mr. Ryan’s latest salvo seems more of the same. Continue reading "CUPE's Call To Ban Israeli Academics"
Well, we're less than a week away from the start of the final act of Battlestar Galactica (BSG). The second half of season four is starting on January 16th, and this is where the series will end. Just like after season two, the BSG folks have put out webisodes which take place in between season 4 and season 4.5. It is entitled, "Battlestar Galactica: The Face of The Enemy." Major spoiler alert, if you have not watched season 4 of BSG, you shouldn't watch these webisodes. There are ten episodes which are being slowly released as every couple days. Enjoy. I am both happy that BSG is starting up again, yet sad that the series is ending. This is a follow-up article to "I Am Not A Mercenary Coder" because there is a new chapter to the story, and no, I have not joined a mercenary outfit. If you don't want to re-read it, let me give a brief overview again. A couple months ago, one of my friends joined a shady start-up in Silicon Valley and kept pestering to me to visit him for lunch. I finally went to visit him, but the lunch turned out to be a trap, and they were trying to recruit me to their organization, and I had to sit through a sales pitch by their CEO. After that incident, relations with my friend has been chilly at best since I decried their recruiting tactics. Fast forward a couple months, and I come across my friend again at a dinner and movie event because the party organizer is a mutual friend. We go out for dinner first before the movie, and the friend is supposed to join us for the movie. We hold seats for him until the theater becomes packed, and we're forced to surrender the seat. Looks like the guy is a no show. The organizer is visibly annoyed because he's been blowing off events like this consistently. As we're driving away from the theater, we receive a text message from the friend saying he just got here, and wanted to do dessert. Over dessert, I discover that this guy has jumped ship to yet another start-up in less than three months; however, this time, the start-up is even smaller, and the business plan is even more unsound. Throughout the rest of the night, he pokes around asking if I'm still happy with my current job, and whether I'm being properly compensated. Obviously the guy is on a fishing trip, trying to recruit me yet again. At this point, I start providing short conversation ending responses. After that, I thought to myself how stupid it would be to follow this guy around. If I had joined his previous start-up, he would have jumped ship, and I would be stuck either at the start-up, or I'd be following him to yet another job. It was only a couple months ago when he was ranting and raving about his previous employer. It's also not ideal that he's now super busy and constantly canceling on friends at the last minute. I hope I never become that man.